Peter is pretty up front about how the reviews are arrived at and the difference between those and "Picks of the year". Might be useful for him to actually call it "Peter's Choice" or other eponymous title. Agreed but when you are King of your own fiefdom, you can pretty much do what you want!!. I like hearing his picks. Mayybe he shouldn't call them skis of the year but rather Peters Picks. I think that's the right title! Now all that has to happen is Peter deciding we are all correct of our ?analysis? 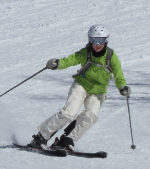 of his ski reviewing system vs choice of the year decision and implement.